In all actuality the EDC having to even ask for a variance I think brings up possibly a bigger issue. If you look at the map, you will see 3 areas (gray areas) that were annexed into the City Limits in 2001. Found in Vol. 777 Page 379 of the official Deed Records; (amazing what you can get online now-a-day). It appears, in my estimation of location, that there should be all City Services on the opposite side of Hwy 11 from the proposed site. So shouldn't the EDC or City be able to bore under the highway to tap into the sewer line? According to what I found online there is a legal time limit within which a city is required to provide services to annexed areas. "Most city services are required to be provided immediately upon annexation. However, State law also requires that a city provide "full municipal services" within 2 ½ years after the effective annexation date. If services cannot reasonably be provided within 2 ½ years, the maximum time allowed by State statute is 4½ years." Annexed into the City in 2001, means by 2006 at the latest, all services should have been made available to all property owners in the annexed areas. Simple question: Has the City provided all city service to all the property owners of the annexed areas? They have been paying full city taxes and State law says you must and the deed records showed that you agreed to provide the services. I think if there are property owners who were annexed in the City and now 12+ years later they still do not have full city services they deserve a refund of city property taxes paid plus interest. I'm sure this will get City Hall in an uproar. This just burns my hide!! 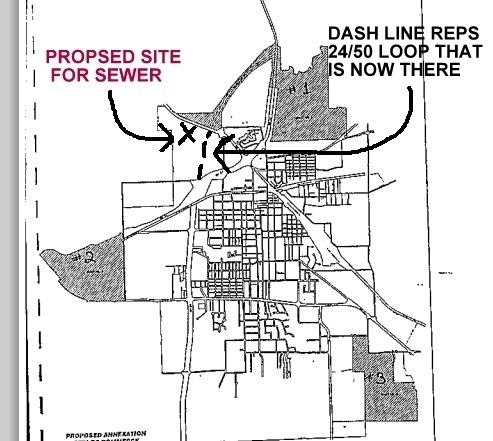 The Commerce EDC is asking for a variance at a special city council meeting to allow for the EDC to install a septic system inside the city limits because existing service is not at the property. Now when asked for a similar variance for Outdoor Adventure at the U it was denied and even more specifically current EDC Board member Jenna Hill spoke out against allowing it, saying a precedent would be set. Her husband Richard Hill voted against it. Commerce City Code in section 94-27 "Upon request of the owner or his agent of a lot or tract of land accompanied by the payment of the pro rata and tap charges, the city may extend, lay or construct all necessary water and/or sanitary sewer mains, including all appurtenances thereto, the distance to and across the frontage of the lot or tract of land for which service has been requested." Now I know the council will pass this. But this is bs in more ways than one! You denied a similar request to the University and the EDC has $1.5 million dollars in the bank and those funds are to be used for infrastructure improvements. Hello!! How is this not considered an infrastructure improvement. I'm sure at the City Council meetings there will be grandiose comments about how this needs to be done and how important it is to the community as a whole. Frankly, I plan on staying home so I don't have to listen to the crap. What is at or near the top of the list? My opinion: A town without thriving churches is a town in trouble. Am I doing what I can to help my town grow???? Am I doing what I can to help God's Kingdom grow? Unfortunately for Quay the answer is no.